Ken Menkhaus is a professor of political science at Davidson College and a specialist on Somalia and the Horn of Africa. He worked on famine response policy in Somalia in 1991 and served as a political advisor in the U.N. Operation in Somalia in 1993-94. He is author of over 50 monographs, chapters, and articles on Somalia and the Horn of Africa, and has testified five times before congressional committees on aspects of the Somali crisis. Somalia is dying. Three-quarters of a million people are at immediate risk of famine; another 750,000 are refugees in neighboring countries, and 4 million – half the total population – is in need of emergency aid. It is a calamity that could join the ranks of the Rwanda genocide and the Darfur crisis in terms of scale and human suffering. 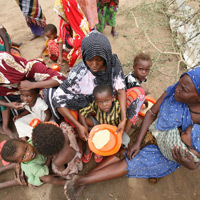 And for Somalia it is a terrible repeat of the 1991-92 famine that claimed 240,000 lives. to take bold diplomatic action to remove impediments to the delivery of aid. unforgiveable instance of lack of political will to push policy beyond incrementalism. of the faith presides over the mass deaths of its own people. negotiations by individual aid agencies, is not nearly enough. for food aid, which they can then divert. No famine is complete without vultures. in a refugee camp for the next 20 years.